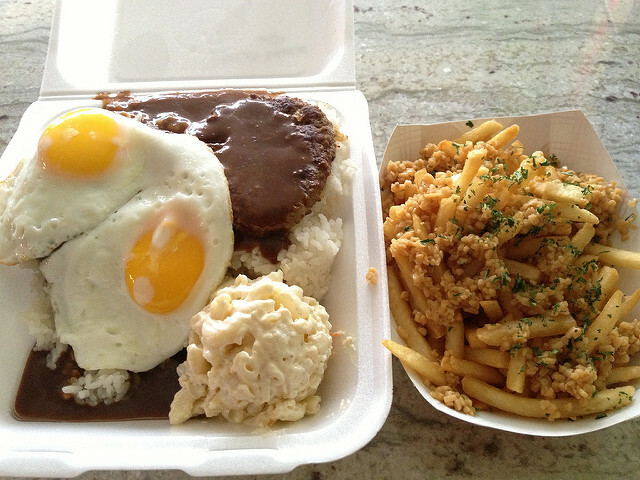 Loco moco and garlic fries from Ono in Waimanalo. This joint closed the next day with no announcement. 2/1/13. 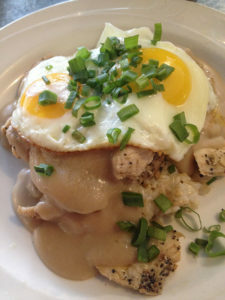 Chicken loco moco from Downbeat Diner. 3/13/15. Because I listen to a lot of sports talk, I become sensitive to whatever the athletes and their pundits say. What miffs me lately is “at the end of the day…” which isn’t really bad. It’s just that they all say it now, all the time, sometimes multiple times in one conversation. Please just gouge my eyeballs out with a dull spoon instead. You know, I’ve learned to be pretty easygoing when it comes to eating out. I’ll admit to a half-second of peevishness when at a fast food place I ask for my order to dine in and they pack it to go, but it’s fleeting, because I realize I’m not paying enough for my food and that kind of pickiness. If it’s fast food, I want it quick, predictable, and tasty (enough), so whatever. 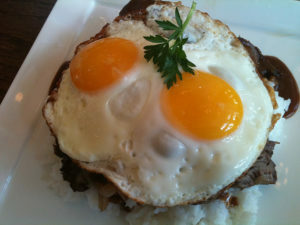 Prime rib loco moco from Yogurstory when that joint was still good. 4/16/11 (Foursquare Day). Oh, I just thought of a good one. There are places around here that won’t serve an egg sunny-side up, ostensibly for health reasons. You know, we who enjoy a runny (or even raw) egg know what we’re getting into. If we order it anyway, just give it to us. At the campus where I work, you can’t get a sunny-side-up egg, but nine feet away in a chill case is ready-to-go poke. Cubes of raw fish are okay but a sunny-side-up egg isn’t? Who makes these rules? 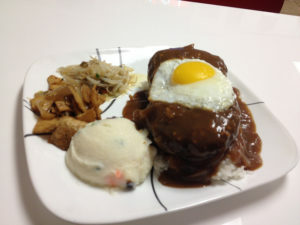 Korean-influenced loco moco from Red Pepper on Fort St. Mall. 1/20/15. It honestly shouldn’t bother me, and maybe this goes under language rather than tech, but the mass media have a way of misusing tech terminology. They do it so often that their misunderstanding of the term becomes the commonplace usage. One (dated) example is the flash mob. A flash mob used to be a nearly spontaneous group behavior where “organizers” (such as this could be called organized) sent out text messages with simple instructions, such as “Walk into the Pali Highway Safeway at exactly 10:00 a.m. today and purchase exactly one orange. Pay for it at register 1. Pass it on!” You never knew how many people were going to show up or if there would be some rebel who’d show up and buy an apple instead, but there was a spontaneity combined with surrealism that was magical. 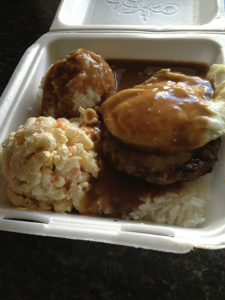 Loco moco from Candi’s Catering and Cafe. Over easy instead of sunny-side up. Irritating! This joint closed shortly after I took this photo. Serves it right for serving it wrong. 4/16/15. And if you’ve missed my saying it before, here it is again: Chalkdust is not a blog. Am I a tech/language snob? Only if you consider my usual, insistent position snobby: if language changes because we’re using it creatively, the language becomes richer and more dynamic. If it changes because we’re too lazy to use it specifically or correctly, the language becomes dingy and dull. I move pretty slowly through crosswalks. I’m old and often injured, and often am in the middle of a ten-mile walk. Cut me some slack, please. For a stretch of time when I was young, New Jersey restaurants were banned from serving eggs that weren’t cooked all the way through. Johnny Carson had a a good stretch of jokes about that law. Hahahahaha. No. But I appreciate the attempt! I love your comment about language changing because it’s not being used correctly. It makes me think of how using “literally” wrong is becoming okay. You know the literal/figurative flip in meaning happens a lot, over time. Many words take on their opposite meaning, such as “moot,” which originally mean open to question, or subject to discussion. Now we use it to mean the opposite: no point in discussing it. 1. What’s one of your language-related (that is, something people say or write) pet peeves? 2. What’s one of your dining-out-related pet peeves? My knee jerk reaction was restaurant closings and sayonara to unique favorite dishes. Arrived too early to pick up a sorority sister from her waitressing job. The old man who owned the restaurant invited me into the kitchen. “Ronnie, you are too skinny.” We made Mediterranean Veal together which involves five cheeses, asparagus with hollandaise and french fries. “Veronica, you are a good cook. Sure you’re not Italiano?” Pretty sure. Mille grazie, Signore Giuseppe! So so so. I’m going with the misuse of the term “supper club”. A very distinct and extinct type of restaurant. Fancy resort restaurants and northwood taverns are confused indiscriminately. I sorrowfully do not believe there are any supper clubs existing. 3. What’s one of your technology-related pet peeves? Suddenly could not copy ‘n’ paste. Rebooted per instructions. Lost five years of internet indexing and files. Operating on new system. And now I receive notices of game downloads and programs every hour which cannot be deleted. Arigatou, Microsoft! 4. What’s one of your television-watching pet peeves? My television is on TCM unless there is a football game. My favorite teams are Green Bay Packers, Japan, All Mitsubishi Lions and British Columbia Lions. Why can I only watch NFL on TV? I used to have a television show. Chalktalk Starring Veronica And Candy Review. My friends and I summarized the weeks’ football games. We’d scour the internet and diagram significant plays. Actually it was a whiteboard with magic markers and not an actual chalkboard. In fact, that’s how I came across Chalkdust Octopus. Searching for my show. When we’d covered the football material we’d discuss candy and soda water. In fact, we broke the big news stories on Jelly Belly soda and candy raisins. We were the highest rated cable access program. Yes. Even higher than the City Common Council meetings. And thank you for all of your kind fan mail but at the time graduating from junior high school was more important than marriage. Why can’t I watch Tokyo Gas Creators vs Asahi Beer Silver Stars? 5. What’s something you do that you know peeves others? As the youngest sister I have torture down to a science. There was a neighborhood Halloween party at night. I do not agree with adults participating in childish activities but I wore a blonde wig, big old mom jeans, Alice Cooper eyes, thick woolen belted plaid kimono jacket and Birkenstocks. With black socks. She didn’t get it, either. Then there was the time I got kicked out of school for that lunchtime incident with LaChanette but she had it coming. That’s funny. My TV is always on one of the football channels (during football season) but I flip over to TCM when there’s something good on. TCM has spoiled me for classic films on other stations. I can’t handle commercials anymore.